The analysis of real data by means of statistical methods with the aid of a software package common in industry and administration will certainly be part of a future professional work of many students in mathematics or mathematical statistics. Commonly there is no natural place in a traditional curriculum for mathematics or statistics, where a bridge between theory and practice fits into. On the other hand, the demand for an education designed to supplement theoretical training by practial experience has been rapidly increasing. There exists, consequently, a bit of a dichotomy between theoretical and applied statistics, and this book tries to straddle that gap. It links up the theory of a selection of statistical procedures used in general practice with their application to real world data sets using the statistical software package SAS (Statistical Analysis System). These applications are intended to illustrate the theory and to provide, simultaneously, the ability to use the knowledge effectively and readily in execution. 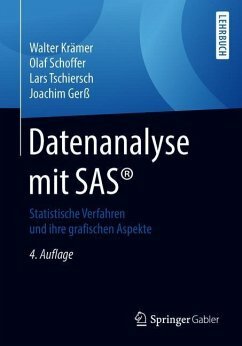 An introduction to SAS is given in an appendix of the book. Eight chapters present theory, sample data and SAS realization to topics such as regression analysis, categorial data analysis, analysis of variance, discriminant analysis, cluster analysis and principal components. 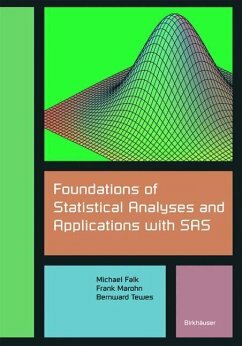 This book addresses the students of statistics and mathematics in the first place. Students of other branches such as economics or biostatistics, where statistics has a strong impact, and related lectures belong to the academic training, should benefit from it as well. It is also intended for the practitioner, who, beyond the use of statistical tools, is interested in their mathematical background. 1. Elements of Exploratory Data Analysis.- 2. Some Mathematical Statistics for the Normal Distribution.- 3. Regression Analysis.- 4. Categorical Data Analysis.- 5. Analysis of Variance.- 6. Discriminant Analysis.- 7. Cluster Analysis.- 8. Principal Components.- Appendix: A Brief Introduction to SAS.- A.1 Preface.- A.1.1 SAS-Modules.- A.1.2 Different Modes with SAS.- A.2 Fundamentals of SAS Programming.- A.2.1 The Display Manager System.- A.2.2 DATA and PROC Steps.- A.2.3 Some Basic SAS Statements.- A.2.4 Programming in a DATA Step.- A.3 Some SAS Procedures.- A.3.1 PROC MEANS.- A.3.2 PROC GPLOT.- A.3.3 PROC IML.- Data Index.